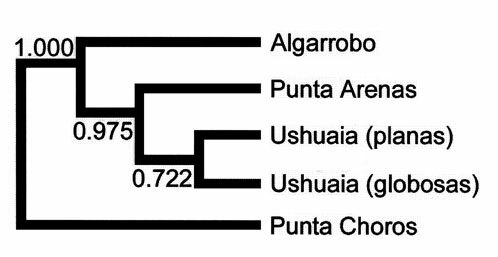 The correspondence between allozymic variation and specific differentiation was studied in four populations corresponding to the three nominal, allopatric species of clam genus Eurhomalea (E. rufa, E. lenticularis, E. exalbida) described for southern South America. Allozyme variation scored in 12 loci was high as indicated by heterozygosity levels (15.8-20.7 %) and by the presence of only three monomorphic loci (Hk-2, Icd-2, and Xdh-1). These high estimates of allelic variability were influenced by the low levels of interspecific genetic similarity (I = 0.64) and for the high conspecific values of genetic identity observed. The high estimates of substructuring found at the species level (FST = 0.39) contrasted with the low differentiation (FST = 0.027) and high migration rate (Nm = 9) existing among conspecific samples. Diagnostic allele fixation coinciding with specific recognition was recorded at locus Hk-1 whereas nearly-fixed differences at loci (Adh, a-Gpd, Icd-1, Ldh, Odh, Pgm-3) differed sharply in frequency among species. The Wagner procedure and the neighbor-joining algorithm produced a similar tree topology highly related to the geographic distance and to their taxonomic recognition. The lack of coincidence between patterns of allozymic variation and the two distinctive shell morphs (flat and globoid) occurring in E. exalbida from Ushuaia bay do not support their taxonomic recognition. Key words: allozymic variation, Eurhomalea, genetic structure, taxonomic status. Se estudió la correspondencia entre la variación bioquímica y la diferenciación específica en cuatro poblaciones correspondientes a las tres especies nominales y alopátricas en las almejas del género Eurhomalea (E. rufa, E. lenticularis, E. exalbida) descritas para la zona sur de Sudamérica. La variación alozímica registrada en 12 loci fue alta como lo indican los altos niveles de heterocigosidad (15,8-20,7 %) y por la presencia de solo tres loci monomórficos (Hk-2, Icd-2 y Xdh-1). Esta alta estimación de variabilidad alélica influyó en los bajos niveles de similitud genética interespecífica (I = 0,64) y en los altos valores de identidad genética conespecífica observados. El alto grado de subestructuración poblacional interespecífica (FST = 0,39) contrasta con la poca diferenciación (FST = 0,027) y la alta tasa de migración (Nm = 9) existente a nivel intraespecífica. Coincidiendo con la situación específica de estas tres especies, se observó fijación alternativa de alelos en el locus Hk-1 mientras que los loci (Adh, a-Gpd, Idh-1, Ldh, Odh, Pgm-3) están fuertemente diferenciados en sus frecuencias. El procedimiento de Wagner y el algoritmo de Unión al Vecino produjeron topologías similares, altamente relacionadas con la distancia geográfica y con la situación taxonómica. La falta de coincidencia entre los patrones de variación y los dos morfos (planas y globosas) presentes en E. exalbida de la bahía Ushuaia no apoyan su reconocimiento taxonómico como entidades genéticas discretas. Palabras clave: variabilidad alozímica, Eurhomalea, estructura genética, situación taxonómica. Protein electrophoresis techniques have been and continue to be widely used and accepted tools in systematics and population studies (Beaumont & Beveridge 1984, Zouros & Foltz 1984, Gardner & Thompson 1999, Dufresne et al. 2002, Féral 2002). Electrophoretic data are a valuable tool for classifying because the genetic similarities within and between taxa provide phylogenetic information above (Buroker et al. 1979a, 1979b, Lavie et al. 1987, McDonald & Koehn 1988, McDonald et al. 1991, Gardner & Thompson 2002) and below the species level (Day & Bayne 1988, Backeljau et al. 1994, Gallardo & Carrasco 1996, Gallardo et al. 1998, Dufresne et al. 2002, Gajardo et al. 2002). Traditionally, three allopatric species of Eurhomalea (E. rufa, E. lenticularis, and E. exalbida) have been recognized in southern South America. The distributional range of E. rufa extends from Panama to northern Chile whereas E. lenticularis has a restricted distribution limited to the coast of central Chile. Eurhomalea exalbida has the southernmost and extended distribution, from Chiloé island to Buenos Aires (Carcelles 1950, Osorio et al. 1979, Reid & Osorio 2000). In spite of being an exploited resource (anonymous 1998), no comparative study has yet been published on the genus. In fact, the few and scattered research on ecological variables, growth and production, reproduction, recruitment rate, survival, and energetic variation have been conducted only at the population level (Urban & Tesch 1996, Jaramillo et al. 1998, Sousa et al. 1998, Campos et al. 1999, Lomovasky et al. 2001, 2002a, 2002b, Morriconi et al. 2002). Morphological characters in Eurhomalea have shown to be somewhat confusing for systematic purposes (Soot-Ryen 1959, Osorio et al. 1979, Ramírez 1993, Reid & Osorio 2000). Recent paleontological data suggest that E. exalbida and E. lenticularis should be grouped in a new genus, Retrotapes (Del Río 1997). In addition, two highly distinctive shell morphs are suspect to represent different age groups in E. exalbida from Ushuaia bay, Argentina (Lomovasky personal communication). Here, the allozymic relationships and the degree of population structuring of Eurhomalea species are examined by electrophoretic markers. Having in mind the morphological differences observed in E. exalbida, we aimed to test whether there was a correspondence between shell morphology and the electromorphic patterns recorded for each one of them. Sample designation, geographic coordinates and number of specimens per sample were as follows: (1) E. rufa, Punta Choros (29°16' S, 71°33' W), n = 25; (2) E. lenticularis, Algarrobo (33°20' S, 71°40' W), n = 40; (3) E. exalbida, San Juan Bay, Punta Arenas (53°40' S, 70°56' W), n = 40; (4) E. exalbida, Ushuaia Bay, Beagle Channel (54°50' S, 68°16' W), n = 80. The two distinct shell morphs were recognized in the same population from Ushuaia Bay (40 flat and 40 globoid) and were treated as different samples, for operational purposes. All specimens were scored electropho-retically at 12 enzyme loci as described by Gallardo et al. (1998). The hepatopancreas was excised in 0.05 M Tris-HCL, buffer, pH 8.0 and centrifuged according to Gallardo et al. (1998). The enzymatic systems assayed were: alcohol dehydrogenase (Adh, EC. 1.1.1.1; IUPAC-IUB 1984), glycerol-3-phosphate dehydrogenase (a-Gpd, EC. 1.1.1.8), phosphoglucomutase (Pgm, EC. 2.7.5.1), octopine dehydrogenase (Odh, EC. 1.5.1.11), hexokinase (Hk, EC. 2.7.1.1), glucose-phosphate-isomerase (Gpi, EC. 5.3.1.9), malate dehydrogenase (Mdh, EC. 1.1.1.37), xanthine dehydrogenase (Xdh, EC. 1.2.1.37), isocitrate dehydrogenase (Idh, EC. 1.1.1.42), superoxide dismutase (Sod, EC. 1.15.1.1), lactate dehydrogenase (Ldh, EC. 1.1.1.27). Starch geles were stained according to Selander et al. (1971), Harris & Hopkinson (1976) and Dillon & Davis (1980). Alleles were designated alphabetically according to their migration relative to the most common allele. For calibration, selected individuals from different localities were run side by side on the same gel. A locus was considered polymorphic if the frequency of the most common allele did not exceed 0.95. Heterozygosity was derived from the electromorphic genotypes by direct count. Expected heretozygosity was estimated by the method of Levene (1949) for small samples. All this procedures were made using the program BIOSYS 1.0. The inter- and intra-specific genetic relationships between pairs of samples was obtained by Nei´s unbiased genetic identity (I; Nei 1978) and by Rogers's modified distance (D; Rogers 1972). The D matrix, bootstrapped 1,000 times was subsequently used in a phylogenetic analysis using FITCH (Felsenstein 1993). The cumulative results of the FITCH analyses were expressed as a majority-rule consensus tree using CONSENSE. A Wagner tree procedure (based on Rogers D) was also chosen to depict the genetic relationship among populations (Swofford & Selander 1989). Wright's (1978) hierarchical analysis of breeding structure for subdivided populations was used to identify sources of spatial differentiation in gene frequencies attributable to substructuring (FST). Mean estimates of the F-values were estimated with FSTAT 1.2, by jackknifing over loci to reduce the effect of deviant samples (Goudet 1995). Although high standard measures of genetic variation were found in Eurhomalea, our estimates are within the limits reported for other bivalves (Ayala et al. 1973, Buroker et al. 1979a, 1979b, Gallardo et al. 1998). Heterozygosity level and percent polymorphism ( = 49.3 %) was high as reflected by the twelve variable loci having up to six different alleles across populations (Table 1). Direct-count heterozygosity fluctuated between 15.8 and 20.7 % and significant heterozygote deficiency (ranging from three to four loci) was found across the sampled localities (Table 1). Diagnostic alleles differences were found among the three species at locus Hk-1. Nearly-fixed allelic differences between rufa-like, lenticularis-like and exalbida-like samples ocurred at six loci (Adh, a-Gpd, Icd-1, Ldh, Odh, and Pgm-3). Loci a-Gpd, and Icd-1 were diagnostic for the discrimination of E. rufa from the other two species. Locus Odh in E. exalbida was fixed or nearly-fixed for allele B, whereas allele A is fixed in E. lenticularis. Nei's genetic identity was very high among conspecific samples of E. exalbida (I = 0.989) but it was much lower at the interspecific level (I = 0.724 between E. exalbida and E. lenticularis). Genetic identity was 67.7 % between E. exalbida and E. rufa and it was 53.8 % between E. lenticularis and E. rufa. Lack of discrimination and high identity values (I = 0.995) were obtained between the two sympatric morphotypes of E. exalbida. Three clusters highly consistent with both the geographic location and the specific status of the samples were produced by the Wagner tree. The first one contained the northern sample of E. rufa (Punta Choros); the second was formed by E. lenticularis from Algarrobo, and the third was formed by E. exalbida from San Juan Bay and Ushuaia Bay (not shown). An identical tree topology with high bootstrap support was also obtained with FITCH (Fig. 1). Low estimates of population substructuring were found within the three samples of E. exalbida (FST = 0.027). The migration rate derived from this FST value corresponds to an exchange of nine individuals per generation. Nevertheless, if the five samples are treated as conspecifics, the standardized variance of gene frequencies (FST = 0.39) suggest an exchange rate of 0.4 individuals per generation. Fig. 1: Majority-rule consensus tree derived from a distance matrix (neighbor-joining) of five populations of Eurhomalea. Bootstrap values shown at nodes are a measure of repeatability based of 1,000 bootstrap iterations. Árbol de consenso mayoritario derivado de una matriz de distancia (neighbor joining) de cinco poblaciones de Eurhomalea. Los valores de bootstrap mostrados en los nodos son una medida de repetitividad basada en 1.000 iteraciones. A high variability in allozymic patterns has been reported in marine organisms (Ayala et al. 1973, Campbell et al. 1975, Nevo 1990, Dufresne et al. 2002, Gardner & Thompson 2002). Mean polymorphism (49 %) and the average heterozygosity level (18.3 %) is high in Eurhomalea but within the range of other marine invertebrates (Buroker et al. 1979a, 1979b, Nevo et al. 1984, Day & Bayne 1988, Backeljau et al. 1994, Gallardo & Carrasco 1996). The observation of an overall deficiency of heterozygotes is a feature common in other studies on more than 50 species of mollusks such as mytilids, pectinids, ostreids and cardids (Nevo et al. 1984). The electrophoretic data recorded for the total Eurhomalea populations provides further evidence for a generalized heterozygote deficiency at enzymatic loci in bivalves. A number of possible explanations for this deficiency include the presence of null alleles, mis-scoring of gels, inbreeding, aneuplody, the Wahlund effect, non random mating, and selection against heterozygotes (Zouros & Foltz 1984, Foltz 1986, Zouros et al. 1988, Gaffney et al. 1990, Gardner & Thompson 1999). Our analyses do not permit an assessment in the detection of the factors responsible for the residual heterozygote deficiencies. Deviation of genotypic proportions may reflect an incorrect procedure for obtaining genotype data, or alternatively, that these populations depart from Hardy Weinberg equilibrium. A consistent association between geographic distribution and allozymic differentiation was generated by both clustering procedures. Resulting from the alternative fixation or nearly-fixation of alternative alleles, these topologies reflect also a clear segregation into discrete genetic units. In contrast, low intraspecific FST estimates and Nei's distance values reflect regional cohesiveness and essential lack of population substructuring in E. exalbida. The high intraspecific estimates of gene flow (Nm = 9) suggest that either for a two-dimensional stepping stone or an island model, random differentiation through genetic drift is prevented (Slatkin 1985). Previous electrophoretic surveys have established that Nei's mean genetic identity is £ 0.85 in about 97 % of interspecific comparisons, whereas in 98 % of intraspecific comparisons is more than 0.85 (Ayala 1975, Skibinski et al. 1980, Sarver et al. 1992, Backeljau et al. 1994). Our results for the conspecific populations of E. exalbida was I = 0.989 whereas the same parameter estimated at the interspecific level fluctuated between 0.538 and 0.724. These results are totally consistent with the morphological and distributional criteria used for species recognition in Eurhomalea as supported by its correspondence with the demarcation limits of allozymic data above mentioned. Based on the evolutionary species concept that emphasizes its genetic integrity over hybridization (Wiley 1981), allozymic studies have recognized sibling species by the presence of fixed allelic differences and large genetic distances (Chambers 1978, Woodruff 1988). Our data also show that Eurhomalea species are allozymically different as demostrated in other molluscan taxa (Liu et al. 1991). The intrapopulational morphs of shell shape (flat and globoid) found in E. exalbida from Ushuaia, assumed to represent reproductively isolated units has no genetic basis to substantiate their taxonomic recognition. Most probably, these morphs represent age groups having distinctive growth rates (Lomovasky, unpublished data). Accordingly, this trait should be considered as a polymorphic one. Since fishery management plans require basic biological knowledge to determine the conservation status of any exploited resource, the existence of three Eurhomalea species and a detailed knowledge of its conservation status should be considered in future governmental actions. This research was partially supported by the German-Argentinean Bilateral Cooperation Program in Science and Technology (BMBF and SECyT) (ARG 001/99 MAR­AL/A99-UXIII/12) and by grant FNC 1010727 to MHG, and FNC 1951202 to EC. The logistic support and sample recollection of T. Brey, B. Campos, C. Guisado, and C. Ríos is greatly appreciated.